enhance their analytical / information processing skills. 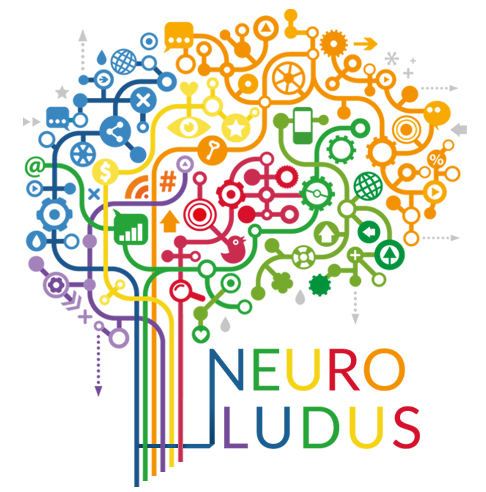 Play NeuroLudus to help us collect data to assess its effectiveness. "Brain, brain, the magical fruit." by Timothy T. Warlow Jr. Following an ecological disaster, some primitive bacteria have attacked the human brain and threaten to erode the superiority of the human race over other living organisms. Save the human race! Play NeuroLudus and collect neuro-energy to rewire human brains. Finding a simple shape hidden in a complex figure using various game plays. The game has 30 levels. NeuroLudus allows players to assess their progress. Recommended playtime: at least 20 minutes every other day. We have used the scientific knowledge to design NeuroLudus as a serious game to enable youth and adults to enhance their analytical/information processing skills by augmenting their cognitive control from field-dependence to field-independence. Field-dependence/Field-independence refer to a global versus an analytical way to process information. NeuroLudus was also designed to match the performance requirements of the Hidden Figures Test (HFT), which is used to classify people on a field-dependent /field independent continuum. Individuals scoring 18 to 32 points on the HFT are classified as field-independent. Those scoring 17 points or lower are classified as field-dependent. We have built the Hidden Figures Test at the beginning and at the end of the game so that you can assess your improvement and repeat the game as many times as you want until you are satisfied with your level of performance. Do not be discouraged if you get a low score on this test, as this will be the case for the great majority of players. NeuroLudus will help you improve your score. NeuroLudus includes game plays and problem solving tasks that are far more challenging than the mental efforts required for taking the HFT test. Therefore even if you get a high score on the test, you are still likely to benefit from NeuroLudus. Exercise, eat well and sleep well to boost your brain training. Exercise jump-starts neuroplasticity (the ability of the brain to modify its own structure and make new neural connection with appropriate training) and neurogenesis (generation of neurons or nerve cells) by pumping more oxygen to the brain. An increase in aerobic fitness can improve the cognitive performance. In order to stimulate the brain, aerobic exercise must be nonstop for an average duration of 30 minutes and performed five times weekly at a comfortable pace. Suggested exercises include: running, bicycling, jogging, brisk walking, distance swimming, skating, jumping rope, rowing, treadmill and dancing. Research indicates that while some food can enhance the development of your brain, others can considerably compromise these functionalities. Experts recommend a balanced diet that includes complex carbohydrates, fruits, vegetables and proteins in order to promote brain development. NeuroLudus was designed to match the performance requirements of the Hidden Figures Test (HFT), which is used to classify people on a field-dependent /field independent continuum. The HFT is integrated in NeuroLudus as pre-test and post-test to allow you to monitor your progress. Individuals scoring 18 to 32 points on the HFT are classified as field-independent. Those scoring 17 points or lower are classified as field-dependent. Reconnect the brain of experts at the speed of a beginner. Once you have reconnected the brain of one, two or three experts, you will take the HFT as post-test to check for any improvement in your ability to process information. Reconnect the brain of gurus at the speed of a competent player. Once you have reconnected the brain of one, two or three gurus, you will retake the HFT as a post-test to check for any improvement in your ability to process information. Reconnect the brain of geniuses at the speed of a pro. Once you have reconnected the brain of one, two or three geniuses, you will retake the HFT as a post-test to check for any improvement in your ability to process information. NeuroLudus will provide you with immediate feedback on your time performance. Please read these Terms of Service ("Terms", "Terms of Service") carefully before using the http://www.neuroludus.com website and the NeuroLudus mobile application (the "Service") operated by Compétences R&D Inc. ("us", "we", or "our"). NeuroLudus is freely accessible to all participating players. Your access to and use of the Service is conditioned on your acceptance of and compliance with these Terms. These Terms apply to all visitors, users and others who access or use the Service. If and when you create an account with us, you must provide us information that is accurate, complete, and current at all times. Failure to do so constitutes a breach of the Terms, which may result in immediate termination of your account on our Service. If you need to use a password to access NeuroLudus you are responsible for safeguarding the password that you use to access the Service and for any activities or actions under your password, whether your password is with our Service or a third-party service. The Service and its original content, features and functionality are and will remain the exclusive property of Compétences R&D Inc. and its licensors. The Service is protected by copyright, trademark, and other laws of both the Canada and foreign countries. Our trademarks and trade dress may not be used in connection with any product or service without the prior written consent of Compétences R&D Inc.
Our Service may contain links to third-party web sites or services that are not owned or controlled by Compétences R&D Inc.
Compétences R&D Inc. has no control over, and assumes no responsibility for, the content, privacy policies, or practices of any third party web sites or services. You further acknowledge and agree that Compétences R&D Inc. shall not be responsible or liable, directly or indirectly, for any damage or loss caused or alleged to be caused by or in connection with use of or reliance on any such content, goods or services available on or through any such web sites or services. You agree to defend, indemnify and hold harmless Compétences R&D Inc. and its licensee and licensors, and their employees, contractors, agents, officers and directors, from and against any and all claims, damages, obligations, losses, liabilities, costs or debt, and expenses (including but not limited to attorney's fees), resulting from or arising out of a) your use and access of the Service, by you or any person using your account and password, or b) a breach of these Terms. In no event shall Compétences R&D Inc., nor its directors, employees, partners, agents, suppliers, or affiliates, be liable for any indirect, incidental, special, consequential or punitive damages, including without limitation, loss of profits, data, use, goodwill, or other intangible losses, resulting from (i) your access to or use of or inability to access or use the Service; (ii) any conduct or content of any third party on the Service; (iii) any content obtained from the Service; and (iv) unauthorized access, use or alteration of your transmissions or content, whether based on warranty, contract, tort (including negligence) or any other legal theory, whether or not we have been informed of the possibility of such damage, and even if a remedy set forth herein is found to have failed of its essential purpose. Compétences R&D Inc. its subsidiaries, affiliates, and its licensors do not warrant that a) the Service will function uninterrupted, secure or available at any particular time or location; b) any errors or defects will be corrected; c) the Service is free of viruses or other harmful components; or d) the results of using the Service will meet your requirements. Compétences R&D Inc. ("us", "we", or "our") operates the http://www.neuroludus.com website and the NeuroLudus mobile application (the "Service"). We also reserve the right to use non-personal information, such as your gaming performances for research and the evaluation of NeuroLudus. We compute and displayaggregate of all time best performance measures to enable players to compare theirown performance against that of other NeuroLudus players. We may also share players’ performance data, which have been stripped of all information that can lead to the identification of an individual player, with researchers who collaborate with us for improving the effectiveness of NeuroLudus. In order to ascertain the confidentiality of the players all the analysis of the results will focus on group performances and will not make any reference to the performance of individual players. In addition, we may use third party services such as Google Analytics that collect and analyze this type of information in order to increase our Service's functionality. These third party service providers have their own privacy policies addressing how they use such information. We do not knowingly collect personally identifiable information from individuals under 18. If you are a parent or guardian and you are aware that your Children have provided us with Personal Information, please contact us and we will delete such information from our servers immediately. This project is conducted under research ethic approval obtained from l’Université du Québec à Montréal (UQAM).